NEW YORK, Jul 20 2012 (IPS) - The United States is suffering one of its most severe droughts in decades, leading to both widespread crop failures and increased public concern about the impacts of climate change. According to a new report from the National Oceanic and Atmospheric Administration (NOAA) Climatic Data Center, the northern hemisphere’s land and ocean average surface temperature for June was the warmest ever recorded. The same holds true for the previous two months. “Drought events are likely to become more frequent and intense in many parts of the world, particularly in the southwestern U.S.,” Andrew Freedman, a senior science writer for Climate Central, a climate news and research organisation, told IPS. The drought, which is less extreme but geographically even more widespread than the one that led to the Dust Bowl in the 1930s – a period of severe agricultural loss in the U.S. – is now affecting more than 60 percent of the country, and 78 percent of the corn-growing regions, according to the U.S. Drought Monitor. The United States Department of Agriculture (USDA) has responded by designating more than 1,000 counties in 26 states as natural disaster areas, making affected farmers eligible for low-interest emergency loans from the Farm Service Agency (FSA). Still, the unprecedented drought will inevitably take a heavy toll on farmers, according to John Hawkins from the Farm Bureau of Illinois, one of the most affected states. 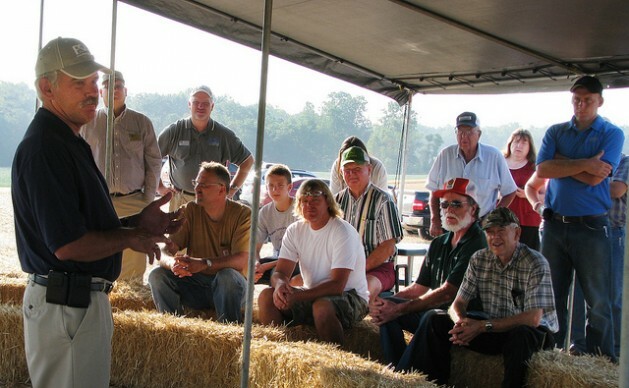 “The loss of crops brings emotional and economic stress to farm families,” Hawkins told IPS. “We have some counties in the most affected areas of the drought (southern Illinois) where they may not harvest a corn or soybean crop this fall if it does not rain,” Hawkins added. With the U.S. the world’s corn producer, growing 40 percent of the world’s supply, the consequences could be very serious and would affect everyone from cultivators to consumers worldwide. In addition to the financial losses that farmers will face, ranchers who mainly feed their cattle with corn and soybeans will also greatly suffer from the drought. As a ripple effect, the whole economy will be affected by the extreme weather conditions. “With fewer cattle and hogs being fed, meat prices for consumers will likely rise next year,” Hawkins added. Rising corn and soybean prices will also greatly affect dairy producers and lead to a price hike in milk and cheese, according to the USDA. Cows are indeed suffering from the heat and the shortage of staple food. In Illinois, “cows that were producing ninety pounds a day are now only producing sixty or seventy pounds daily”, Jim Fraley of the Illinois Milk Producers Association in Bloomington told IPS. “Farmers are doing all they can to keep cows cool,” Fraley added. “There will be milk for sale,” Roger Hoskin, an agricultural economist with the Department of Agriculture’s Economic Research Service, told IPS. “I do not expect lines at the supermarket to buy milk, but prices will likely be higher,” Hoskin concluded. The current weather conditions have also led to other unusual events. The United States has seen a dramatic increase in wildfires since mid-June, according to the National Drought Summary, with more than a thousand homes lost to fire since January. In the Arctic, the ice sheet also melted more than average this June, according to a 2012 publication on the Greenland ice sheet by Jason Box, a researcher at Byrd Polar Research Center. “It is reasonable to expect 100 per cent melt area over the ice sheet within another similar decade of warming,” Box concluded. Many agree that the unusual heat wave is another sign of climate change, and a recent report by the NOAA concluded that, because of human-driven global warming, cold Decembers are now half as likely to occur as they were 50 years ago. The report also focused on the state of Texas, which suffered its driest season in 2011, and concluded that heat waves are 50 times more likely to happen in the state than they were back in the 1960s. A poll released on Jul. 16 by the University of Texas at Austin showed that the current extreme weather conditions have led to a stronger belief in global warming among U.S. citizens. It only took four very dry months for the percentage of respondents denying climate change to fall from 22 percent to 15 percent. Freedman believes the current situation is a product of both human-induced climate change and natural climate variability. “It doesn’t take a genius to conclude that reducing emissions of greenhouse gases, which are causing a large part of global warming, would be a good idea if we want to slow this process down and avoid some of the worst-case scenarios, including more severe drought events,” he told IPS. What confuses me is why we waited to see signs of Climate Change instead of acting 50 years earlier when we already had the physics worked out? Answer: politics. Big money always defeats reason.